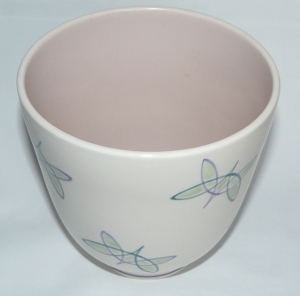 Lovely Poole Pottery Freeform range planter decorated in the contemporary PT Pattern designed by Ruth Pavely and often referred to as the Butterflies pattern! 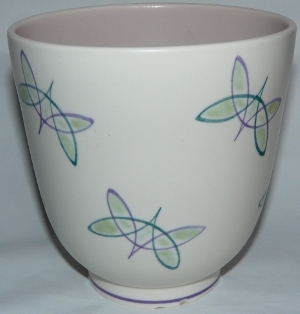 This plant pot is shape number 653 and stands approximately 5¾" tall. It was hand-painted by June March (Vaughan) who decorated at the Poole Pottery from 1957 to 1961. 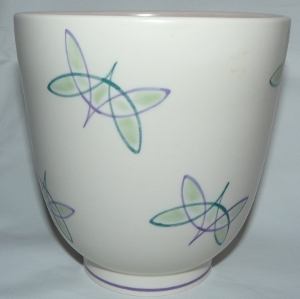 The planter is decorated all around the body with contemporary modern butterfly motifs in colours of green and purple, a lovely pot perfect for any plant! On its base it has the stamped Poole England pottery mark dating c1955 to 1959, the impressed shape number 653, the Poole pattern code PT and the decorator's mark. Based on this information we can date this piece of Poole Pottery to c1957 - 1959. Condition: Very good overall condition. It has two chips to the footed base but is a lovely piece in an unusual pattern and displays very well.